The voices of Steve Carell, Kristen Wiig, and Benjamin Bratt star in an animated film written by Ken Daurio and Cinco Paul and directed by Pierre Coffin and Chris Renaud. 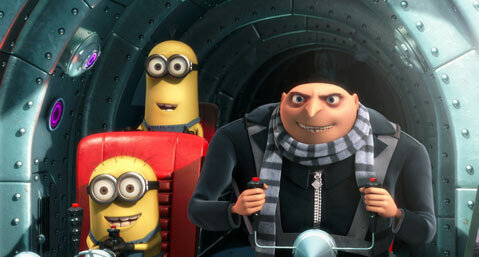 Last time out, super-villain Gru (voiced by Steve Carell) was unwillingly transformed by the power of paternal love after a scheme involving stolen orphans turned into a nightmare comedy of family ties. This film opens after the conversion, where all is peaches and cream inside the villainous-looking suburban secret laboratory, though Gru and hench-scientist Doctor Nefario aren’t doing so well in their newfound jams and jelly business. Meanwhile, a mysterious new arch-criminal steals an arctic lair and starts coming after Gru’s zany, linguistically challenged minions. On top of all this, a woman spy (voiced by Kristen Wiig) with considerable espionage and counter-evil-nemesis powers arrives to befuddle the formerly despicable one as he tries to go good. Oh sure, there are submarines, amphibious vehicles, and transforming formulas, but this movie has one unusual quality: chemistry between cartoon characters. No, it’s not Gru and his lady love — it’s the adorable children and the deplorable minions who steal the show. Despicable Me 2 isn’t super-memorable and the 3-D effects only dazzle at the beginning and the end of the movie (why be so cheap with an alleged budget of $75 million?). But this is also clearly the most excellent of the cartoon epics that opened this benighted season. It might even be the best sequel of summer so far.